للمسافرين الذين يرغبون أن يعيشو كل ما تقدمه هاملتون, Ballinor Motor Inn هو الخيار الأمثل. لا يبعد الفندق كثيراً عن مركز المدينة، فهو يقع على بعد 1. Km منها. في حين يستغرق الطريق منها إلى المطار حوالي 20 دقيقة. سوف يعشق النزلاء موقع هذا الفندق، فهو قريب من أهم المعالم السياحية في المدينة كمثل ‪Riff Raff Statue‬, ‪Waikato Stadium‬, ديبارتمنت اوف كونسرفيشن . يقدم Ballinor Motor Inn خدمات لا غبار عليها وكل أشكال اللياقة وحسن الضيافة اللازمة لإسعاد ضيوفه. يمكن لضيوف الفندق الاستمتاع بالميزات التالية على أرض الفندق: واي فاي مجاني في جميع الغرف, خدمة التنظيف يوميًا, مرافق مخصصة لذوي الاحتياجات الخاصة, تسجيل وصول/خروج سريع, تخزين الأمتعة . تتضمن كل غرف النزلاء وسائل الراحة والتسلية المصممة خصيصاً لضمان الراحة القصوى للضيوف. سواء كنت من محبي الرياضة أو كنت تتطلع لتفريغ عناء نهار صعب، ستجد خدمات ذات مستوى عالي بانتظارك كمثل حوض استحمام ساخن, سبا. يشكل Ballinor Motor Inn بخدماته الراقية وموقعه الممتاز، قاعدة مثالية للاستمتاع بإقامتك في هاملتون. تسجيل الخروج المتأخر يتوفر عند الطلب. Stayed here for 2 nights over the weekend... both blankets on bed were filthy and clearly hadnt been cleaned in a very long time... asked for a clean replacement blanket and barely got a response.. and upon a further followup email all they could manage as a reply is sorry we dont do refunds. No explanantion or apology for the laziness. My parents stayed in another room and had the same issue. I am not one to leave a bad review - but taking my pregnant wife away for a couple of nights - the least i expect for what i pay for is clean bedding or some type of compensation and apology! Great value for money. Clean, tidy and close to the city. The motel is very clean and room is spacious. The host is very friendly and helpful. Location is a little far from the town center. Great room, fantastic check in service. Very roomy with everything you could need. Originally thought we might have a oroblem with road noise, but we didnt. Was great! Slept very well. Perfect for what we needed. Very clean and spacious. Its very good. Would love to come back if its still at the same rate. Very friendly host and lovely atmosphere. Although in room breakfast was offered we only found out on check in a cooked breakfast was not available over the weekends but we were not advised of this on their website or on any booking information. The spa bath was nice and deep despite the lack of actual bubbles for the bath and the size being a standard bath in length made it a struggle to get 2 people in it. The front door didnt seal properly so there was alot of road noise all day and all night which made for a disapointing nites sleep. Assuming the door is fixed or we stay in different room, we would be more than happy to stay there again. 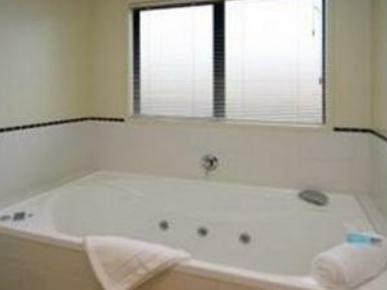 The double jacuzzi bath, the well equipped kitchenette. stopped off in hamilton briefly for the night before the first stage of the nz rally. 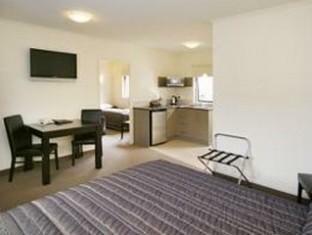 this is clean, modern, well equipped place to stay. efficient and very friendly owner. the double jacuzzi bath was perfect after our long flight/drive. 15-20 min walk into the main part of town. we had a great nights sleep here, perfect for our needs. great motor inn for my short sweet stay. the jacuzzi bath was a highlight. very well equipped room with everything you need for a short stay. it's a longish walk into town (20 mins), but apparently there's a free shuttle bus which takes you to the casino. a taxi back from hood st to the inn was $9. 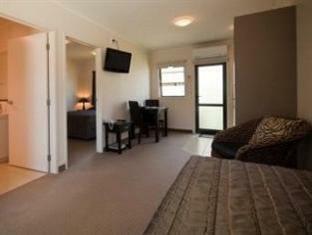 very close proximity to the waikato stadium, a few mins walk. very comfy nights sleep. was concerned about road noise at first, but quietens down a lot during the evening. extremely friendly owner. You get so much for so little. What a great motel this is. Better than most hotels I stay at. The rooms are meticulously clean, beds are comfy, bathroom is spotless. There are all the Sky tv sport and movie channels whish is very rare and a great plus for me. There were nice touches as well like decaf coffee, lollipops, nice toiletries etc. There is also a small private area outside each room. Free off street parking, free internet and super nice staff. I have found my Hamilton place of choice. My husband and I love the warm friendly personality of The Host David, motel rooms has all the ammentities we need and is of a very high standard. 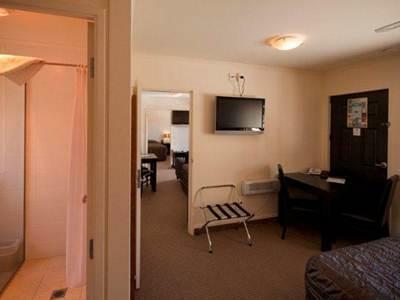 Motel is also in close proximity to the city, shops and supermarkets. Would definitely recommend to all. Will most surely return again AAA++. A tiny minus is carpark too small for 4wd vehicles, thats only because can't reverse properly lol.